coming forth by day: psychopomp qu'est-ce que c'est? The psychopomp is the guide of the soul. Psyche from the greek word for soul and pomp from the greek pompos which means guide. The psychopomp assists at the crossing where worlds meet and assists you in the journey through this new world. In ancient Egypt this role was played by the two jackal deities Anpu (Anubis) and Wepwawet (Ophois). Anpu opened the roads to the north and Wepwawet guided the soul through the paths of the south. In this respect the north and south are metaphors for the soul's journey through the two different planes of existence. The "north" is referring to the road the soul travels when it leaves the bonds of existence entombed in matter. In modern day parlance it's the journey to the judgment and hopefully heaven. 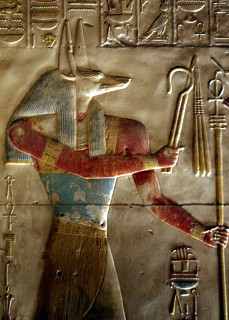 Anpu is the one who leads you to the great hall of Maat and assists in the weighing of your heart. Important to remember is it's the weight of your heart, not the size that matters. (Yeah I'm a big Alice in Chains fan). The path of the south is the soul's journey through this world in the dark, i.e. ensconced in matter. Wepwawet will lead you through this time of darkness that your soul experiences in this material world. The mummy in ancient Egypt is the symbol of the soul entombed in matter and that symbol is mythicized in the life and death of Asar (Osiris in Greek). 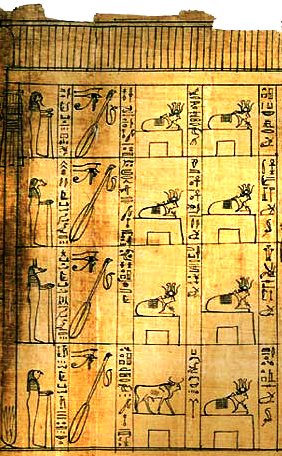 The constellation of Orion in the southern night sky, representing Asar, is no longer visible in the night sky for seventy days in the late spring and it is during these days when Asar in trapped in the plane of matter that he is mummified, hence the seventy day period of mummification followed by the ancient Egyptians. However it is the dog star, known to us as Sirius, that is the guide of this personification of the Ba through the disappearance of Asar into matter and his subsequent re-birth into the spiritual plane that is symbolized by the night sky. Wepwawet is the guide of Asar throughout this perilous journey. One of the great festivals at Abydos, the Great Going Forth, re-enacted this journey. Wepwawet leads Asar from the temple to his tomb in the western desert. During this journey they cross over water, the psychopomp's role is the carrying of the soul over the waters of incarnation to save the soul from drowning in materialism. The star Sirius rises in midsummer, the dog days of summer - a saying that belies the connection of Sirius to canines. This is the brightest star in the constellation of Canis Major, the companion dog of Orion. In far east cultures Sirius is known as the celestial wolf and the indigenous peoples of North America considered Sirius a dog. Interesting is the positioning of Canis Major under the heel of Orion and how we teach our dogs to "heel" while out walking with them. 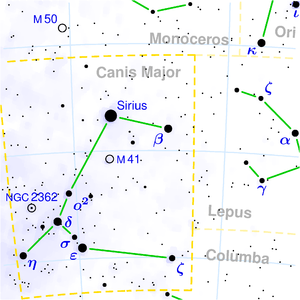 I've touched on Orion being known in ancient Arabia as al Jabbar and the Arabian astronomers referred to Canis Major as the greater dog - Al-Kalb al-Akbar. It was also referred to as the dog of the giant - Al-Kalb al-Jabbar. I'll get to the Arabic name for the dog, Kalb, later on in this blog entry. I'm also fully aware of the ancient Egyptians referring to the star Sirius as Sopdet, which was another name for Aset (Isis). However the equating of Aset to Sirius is also true of the ancient Egyptians equating of Aset to all bright stars in the sky. This makes sense because Aset is the womb (land/matter) for the light to gather in. Wepwawet's standard is the royal placenta which denotes the fact that it is Wepwawet that leads the Pharaoh on the path of birth/death into matter and then death/birth into his immortality among the imperishable stars of the circumpolar region in the sky. It has also been noted that the Pharaoh becomes Wepwawet upon his death with this meaning describing the Pharaoh's role as guide and protector of his people. Wepwawet was also the bestower of legitimacy on the Pharaoh. This is evident in the major part Wepwawet plays in the Heb Sed festival that is a 30 year jubilee celebration of rulership that needs to be renewed. 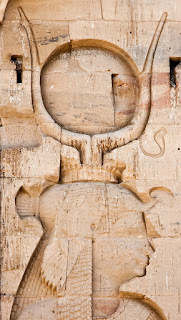 As well Wepwawet features prominently at Abydos granting Seti I of the 19th Dynasty the right to rule by offering him the royal insignia and also participates in the purification of Seti I. 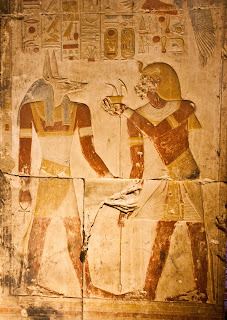 These pharaohs of the 19th Dynasty assumed power due to their connections to the military and therefore stressed the importance of Wepwawet granting them this legitimacy. the racer, the runner, roving the Two Lands. Wepwawet's role as a kind of celestial guide dog made him a popular deity with ordinary people who faced dangerous journeys in life or death. 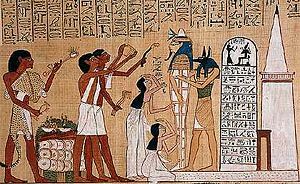 The opener, Anpu, opens the mouth and eyes of the newly mummified deceased. This allows the truth, light and spiritual nourishment to enter into the mummified which in turns awakens the heart and allows it to grow. Throughout previous blog entries I have articulated the symbolic meaning of not only mummification but the dual meaning that life and death could mean to the ancient Egyptians. It is a syncretic existence whereby the soul dies in matter whilst at the same time the material essence becomes dominate. As the material existence wanes, the spiritual is re-born. Mediating between these two states of metaphysical existence is the great Wepwawet. Wepwawet guides the aspirant to and through these two complementary planes of existence. It's the place I go to die and the place where my soul is re-born. This existence is dark; the darkness is where you find the jackal. Jackals are nocturnal and roam in the darkness. Canines, being excellent guides, become the pathfinder par excellence for the soul and its journey through the duat, (pronounced do-wah) the riddle ancient Egyptians encoded in its enigmatic literature that us confounded moderns call their funerary literature. So Wepwawet is a guide who helps carry our soul, that is embedded in material form, over the waters of this metaphorical cleansing sojourn into the deep that is cyclically experienced by the constellation of Orion and esoterically encoded into the ancient Egyptian story of Asar. If you're still reading here comes the good part. I have met a bunch of people in my lifetime that have the Christian name Christopher. Like most things we come across in life I never really gave the name a second thought and assumed it had some connection to Jesus. Well of course it does but what about the echoes into our ancient past that is embedded into this name? masc. proper name, Church Latin Christophoros, from Greek khristophoros, literally "Christ-bearing;" from phoros "bearer," from pherein "to carry" (see infer). In medieval legend he was a giant (one of the rare virtuous ones) who aided travellers by carrying them across a river. Medallions with his image worn by travellers are known from the Middle Ages (e.g. Chaucer's Yeoman). Christopher it seems was a giant who helped out travellers on their journeys. More specifically he would carry the Christ over water, the carrying part from the the -opher in Christopher. 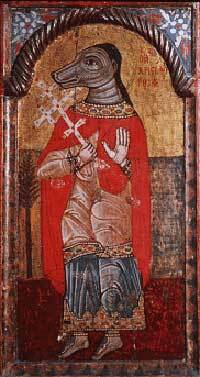 There is a Saint Christopher in the Catholic tradition. He is the patron saint of travellers. 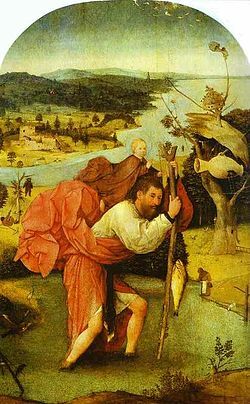 Saint Christopher carried Christ across an unfordable river. As he crossed, the weight of the sins Christ was bearing increased to the point where Christopher almost did not complete the crossing. Christopher became a popular saint especially revered by travellers and especially sea bound voyageurs. Then there are the unexplainable pictures of St. Christopher as a dog headed man that survive from Eastern Orthodox Church lore. This has been explained away as the Byzantine misinterpretation of the Latin term Cananeus to read canines. I imagine there's a better explanation if we open that door into ancient Egypt. 1530s, from Middle French metaphore, from Latin metaphora, from Greek metaphora "a transfer," especially of the sense of one word to a different word, literally "a carrying over," from metapherein "transfer, carry over," from meta- "over, across" (see meta-) + pherein "to carry, bear" (see infer). Related: Metaphoric; metaphorical; metaphorically. 1520s, from Latin inferre "bring into, carry in; deduce, infer, conclude, draw an inference; bring against," from in- "in" (see in- (2)) + ferre "carry, bear," from Proto-Indo-European *bher- (1) "to bear, to carry, to take" (confer Sanskrit bharati "carries;" Avestan baraiti "carries;" Old Persian barantiy "they carry;" Armenian berem "I carry;" Greek pherein "to carry;" Old Irish beru/berim "I catch, I bring forth;" Gothic bairan "to carry;"
Old English ferian "to carry, convey, bring, transport," from Proto Germaic *farjanan (confer Old Frisian feria "carry, transport," Old Norse ferja "to pass over, to ferry," Gothic farjan "travel by boat"), from Proto-Indo-European *per- "going, passage." Related to fare (verb). Related: Ferried; ferries; ferrying. The noun is early 15c., perhaps earlier and from Old Norse ferju- "passage across water," ultimately from the same Germanic root. Old English fær "journey, road, passage, expedition," strong neuter of faran "to journey" (see fare (verb)); merged with faru "journey, expedition, companions, baggage," strong feminine of faran. Old English faran "to journey, set forth, go, travel, wander, get on, undergo, make one's way," from Proto Germaic *faranan (confer Old Saxon, Old High German, Gothic faran, Old Norse, Old Frisian fara, Dutch varen, German fahren), from Proto-Indo-European *por- "going, passage," from base *per- "to lead, pass over" (see port (1)). Related: Fared; faring. "harbor," Old English port "harbor, haven," reinforced by Old French port, both Old English and Old French from Latin portus "port, harbor," originally "entrance, passage," from Proto-Indo-European *prtu- "a going, a passage," from base *per- "to lead, pass over" (confer Sanskrit parayati "carries over;" Greek poros "journey, passage, way," peirein "to pierce, run through;" Latin porta "gate, door," portare "passage," peritus "experienced;" Avestan peretush "passage, ford, bridge;" Armenian hordan "go forward;" Welsh rhyd "ford;" Old Church Slavonic pariti "fly;" Old English faran "to go, journey," Old Norse fjörðr "inlet, estuary"). 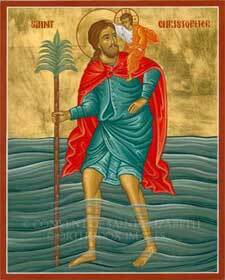 Alright that makes it pretty clear that Christopher carries the Christ over water. We can take water here literally as being an actual river this dog headed man carried Jesus over or we can picture it metaphorically that a beast with the innate tracking and guiding instincts of a dog carried the light called Christ over the waters of material incarnation. Your choice. Before I end this entry I want to go back to the ancient Egyptian word for the ceremony of the Opening of the Mouth and Eyes which is 'wpr'. early 14c., "open to view," from Old French overt (French ouvert), past participle of ovrir "to open," from Latin aperire "to open, uncover," from Proto-Indo-European *ap-wer-yo- from *ap- "off, away" + base *wer- "to cover" (see weir). Confer Latin operire "to cover," from the same root with Proto-Indo-European prefix *op- "over;" and Lithuanian atveriu "open," uzveriu "shut." The carrier of the soul is also the opener that leads this soul to re-birth. 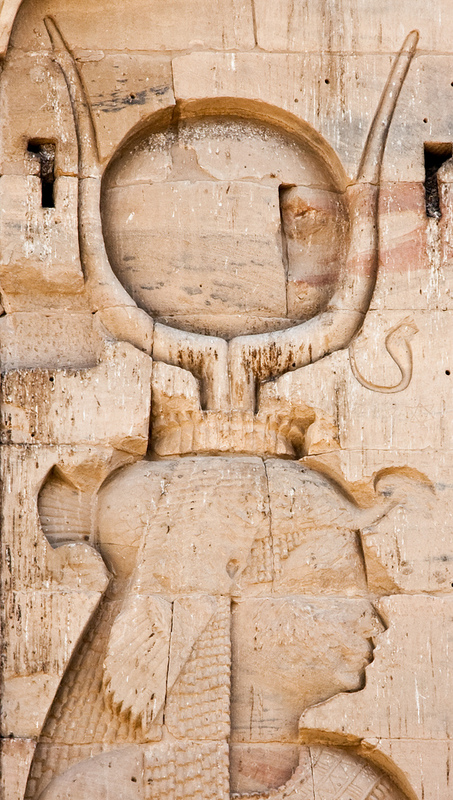 We have seen how the jackals do this for Asar but there is also the female goddess Hathor (Hwt-Har) that performs this duty for Re. 1620s, "the morning star," from Latin Phosphorus "morning star," from Greek Phosphoros "morning star," literally "torchbearer," from phos "light" (related to phainein "to show, to bring to light;" see phantasm) + phoros "bearer," from pherein "to carry" (see infer). So there you have it, the canine is the symbol that opens the pathway and guides the light that has been almost extinguished within ourselves through the darkness of incarnation in matter. This blog entry is longer than I intended so the exploration of the Arabic word for dog, Kalb, will be up next.